If you have lights that are flickering, outlets that are not working or circuit breakers that keep tripping, then call the expert Bentonville electricians at Davitt Electric today. Our master Bentonville electricians are able to handle all types of electrical repairs such as adding and trouble shooting existing wiring, appliance circuits, spa circuits, ceiling fans, cable outlets, dimmers, switches, and telephone jacks.. With our expert electrical troubleshooting, our electricians will be able to diagnosis any electrical problem you may be having. Our Bentonville electricians strive to bring the best possible electrical repair work in the industry. Our Bentonville electricians are truly professionals; they stay up-to-date with all of the latest standards and electrical code. You can rest assure that when our Bentonville electrical repair experts complete your electrical repair it will be done right and will last. Electricity is a great amenity to have in our home, but it can also be a dangerous thing. So don’t just trust your electrical repairs with just anyone. 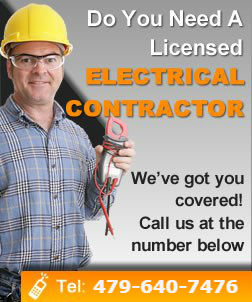 Call your #1 trusted Bentonville electricians for all your electrical repair needs at Davitt Electric today!